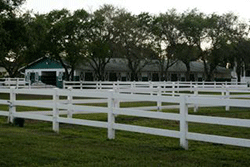 Our facility is located on fourty exquisitely maintained acres in Davie, Florida. Our amenities include a lighted 160′ X 200′ Hunter ring, 90′ X 150′ beginner ring, an indoor air-conditioned viewing lounge and 2 outdoor viewing pavilions. Our farm is like no other. We have a Cross County course and even secluded trails on our unique property. We have a 60ft round pen and an Odyssey trainer to keep our horses and ponies optimal physical health. We are currently adding an additional barn, covered arena and a dressage ring. Blue Water Farm has 2 concrete barns with state of the art amenities including indoor and outdoor wash stalls, tack room with private lockers, bathroom and laundry facilities. Each stall is equipped with an automatic waterer, 24-hour stall cam, rubber mats, fans, and fly spray system. Our property has large paddocks with mature shade trees and ample room to run. The property is totally fenced and secured. There is also staff on premises for monitoring 24/7. For horses and riders this is the perfect environment – bringing security, serenity and convenience all together in a first class training facility. Please visit our Riding Camp Page to view our camp facilities and amenities. For a tour of our facility or for more information please call (954) 600-0451, or email info.bluewaterfarms@gmail.com.